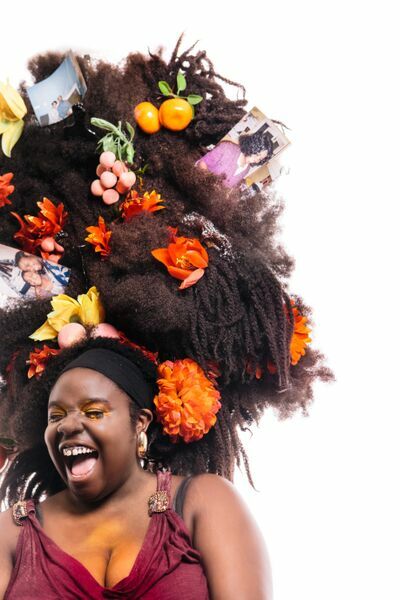 Trichophobics might want to steer clear of this one but theatre goers who are up for something unique and utterly welcoming, I’d highly recommend you head over to the Ovalhouse theatre to catch this show. It was a gorgeous piece of honest and thought provoking storytelling delivered warmly by the wonderful Selina Thompson. Selina was warm and welcoming as we all made our way into the space, making rum punch and acknowledging the “little bit gross” tumbleweave. The Tumbleweave itself was very cosy,for a space made of hair and was the only prop in an otherwise darkened and empty space. We moved around it as Selina told different stories and sat inside it together as an audience member did Selina’s hair. There was a real feel of togetherness throughout; as a white woman too, I never felt like this show wasn’t for me. The piece talks about afro hair and hair’s connection to a black woman’s identity but for any aspects that I myself don’t have as part of my knowledge, it allowed me to explore it too and be part of that; it allowed understanding and as I wrote earlier, it makes you think. Selina started off her show by repeating (and having the audience join in) “Hair is just hair.” But we all know it’s not as simple as that. Hearing some of the astounding figures of what is a massive money making industry hammers home that hair isn’t really just hair. It is a part of our identity and with a society that has a very narrow idea of what is “beautiful” (i.e hair that is straight, long, like a fairytale princess) then that can be incredibly damaging and confusing to young black girls. For a performance that was just over an hour and presented in such a conversational, personal manner, it truly packs a punch. And I’m not talking about the Rum. “Dark and Lovely” is the first instalment of a work Selina is developing. I’m very excited to see more of her work. Running at Ovalhouse until 17th October.